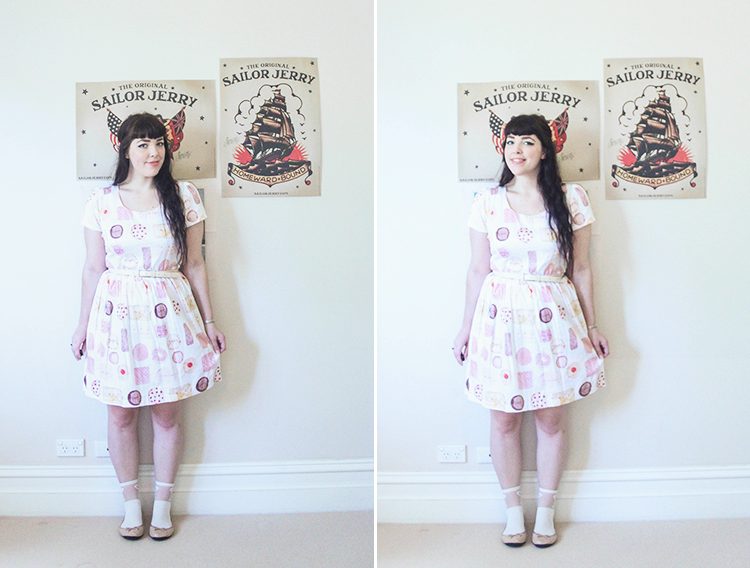 it's about damn time i took proper photos wearing this dress. designed and illustrated by the always lovely caitlin shearer, this dress was my present to myself when i got my current job almost a year ago. 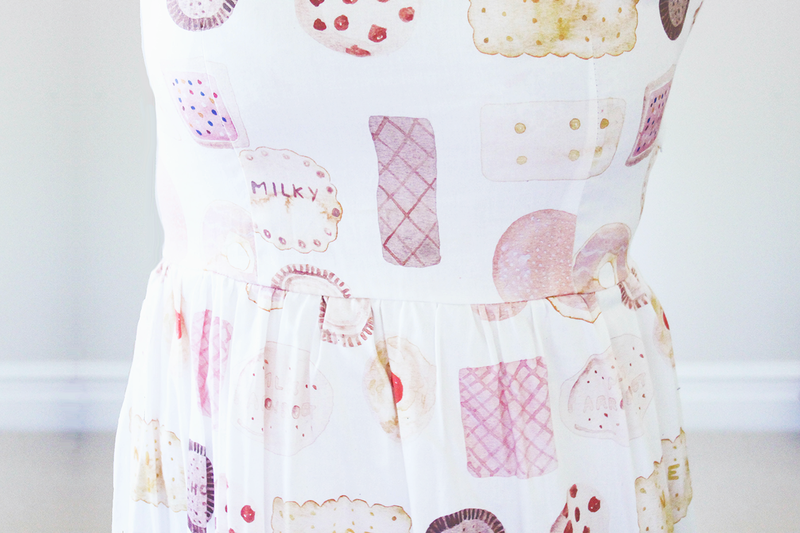 covered in watercolour illustrations of biscuits (as the name would suggest) this dress is perfect in every way for a lover of baked goods like myself. also if you look closely, i'm smiling with teeth in the top photo! i don't even have any issues with my teeth i just never show them when i smile for photos, but apparently there's a first time for everything. LOVE that dress. I have wanted it for so so long! It looks so lovely on you! Such a cute, whimsy dress! Perfect with the belt. Ahhh the dress is absolutely gorgeous and your're rocking it! 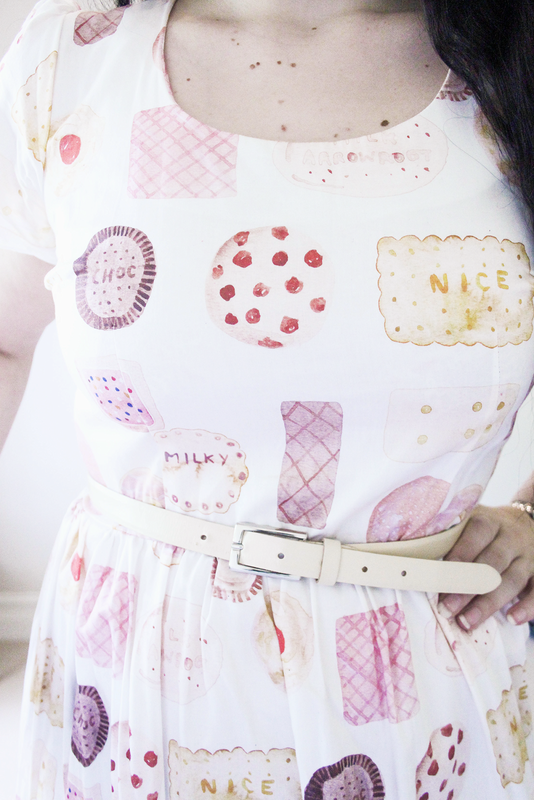 This dress is super sweet! No pun intended, haha. 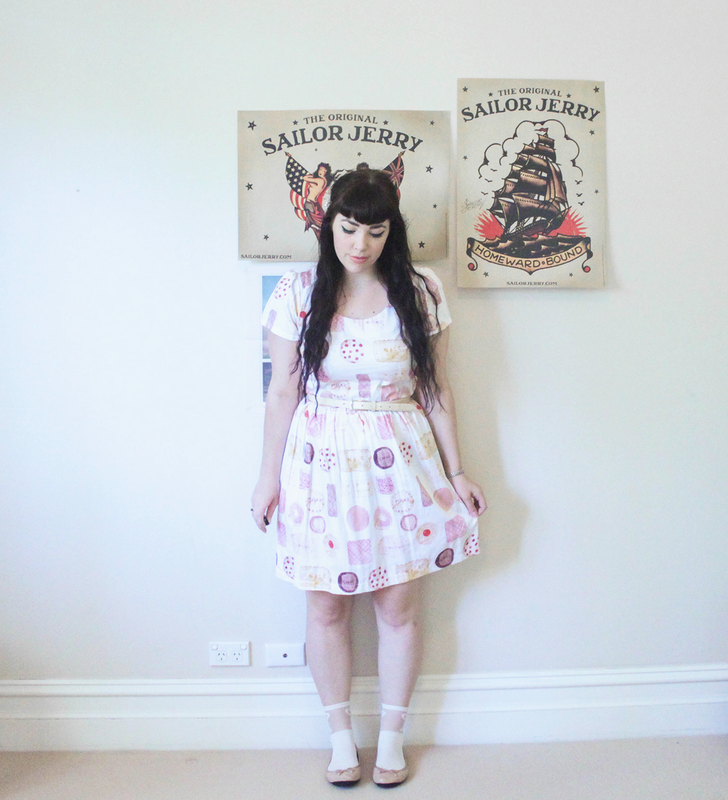 The print is so girly and cute, and I love the watercolour effect. This is such a lovely little series you're doing on your blog. I really want to do more outfit posts on my blog, but I can only do them on my days off, which are most of the time spent being lazy, not getting dressed up! 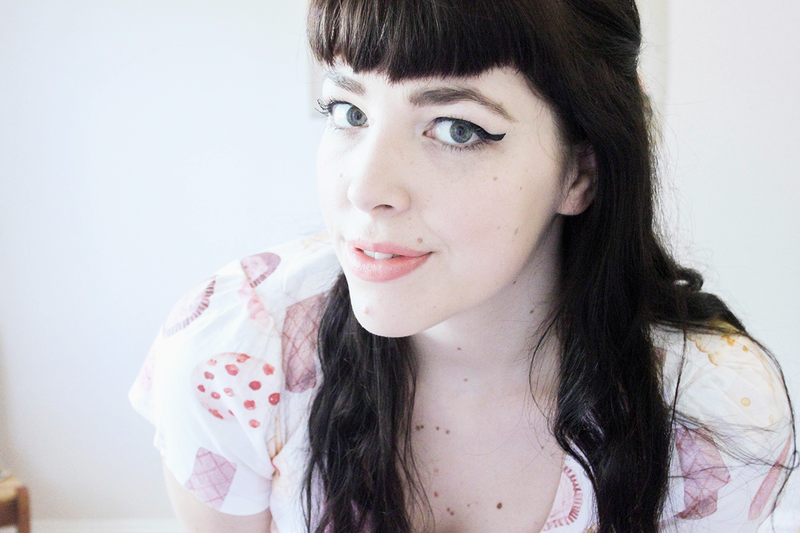 I find it hard to smile with teeth when I'm taking photos of myself, it feels so unnatural! I've done it a couple of times - I usually try to think of something funny, haha. i'm exactly the same! i only have the weekends to take photos and i usually just get ready and then go out if i have plans and i don't make the time to take photos before i leave, and if i'm not going anywhere then i don't bother wearing make up or getting dressed at all, haha. Dress is so lovely and cute, and you are beutifull! What a lovely dress! You are so cute! The print on this dress is so playful and fun! I love unexpected patterns on fabric. Oh Caitlin Shearer! She is a genius, all of her designs are so amazing, I can't get enough of her beautiful prints! This dress is so perfect on you, I bet you get so many compliments when you wear it out :D Just looking at the print is making me salivate! Time to eat biscuits and drink tea I think! isn't she wonderful?! :) and it's always tea and biscuit time! This dress is super awesome! Look great on you. This is literally the sweetest dress ever! It looks great on you, the colours really work with your skin tone and eyes. That dress is so gorgeous! I absolutely love it, the illustrations are so perfect. Beautiful dress. The illustrations are so cute, it suits you so well. I've been eyeing this dress for so long, and it looks smashing on you! The little socks and flats are adorable with it, too. :) I'm a bit obsessed with novelty prints, and this one is amazing. And I wish I could get my bangs to look as good as yours do! This really has to be one of the most marvelously cool, adorable modernday novelty print dresses I've ever seen - not mention, very nearly literally, one of the sweetest, too. You look completely darling, dear gal! oh caitlin shearer! i love her dresses, so simple, adorably cute and flattering! this one is literally delicious!